Most common primary disease-causing organisms of the respiratory tract— Bordetella bronchiseptica and Mycoplasma. Most common gram-positive bacteria—Staphylococcus, Streptococcus, and Enterococcus; gram staining is a technique in which slides with potential bacteria on them are stained in a sequential manner; gram-positive bacteria stain dark purple while gram-negative bacteria stain pink; gram staining allows differentiation of bacteria into groups (that is, gram-positive or gram-negative). Anaerobic bacteria (bacteria that can live and grow in the absence of oxygen)—found in lung abscesses and various types of pneumonia (particularly with aspiration or foreign bodies); approximately 20% of pets with bacterial pneumonia have anaerobic bacterial infections. Bacteria—Bordetella bronchiseptica, Pasteurella, and Moraxella most frequently reported; Mycoplasma considered a primary disease-causing microorganism (known as a “pathogen”) in the lower respiratory tract. Carrier state—may exist; periods of shedding Bordetella bronchiseptica after stress; infected female cats (queens) may not shed the organism during pregnancy (prepartum) but begin shedding it after delivering the kittens (postpartum), serving as a source of infection for kittens. Regurgitation (return of food or other contents from the esophagus or stomach back up through the mouth), dysphagia (difficulty swallowing), or vomiting (forceful ejection of stomach contents up through the esophagus and mouth). Functional or structural (anatomic) defects—paralysis of the voice box or larynx (known as “laryngeal paralysis”); enlarged esophagus (known as “megaesophagus”); cleft palate; inherited disorder in which the normal secretion clearance mechanism of the lungs is defective (known as “primary ciliary dyskinesia”). Reduced level of consciousness—stupor, coma, or anesthesia. Foreign body in the bronchi (part of the airway). Long-term (chronic) dilation of bronchi or bronchioles, as a consequence of inflammation or blockage of the airway (known as “bronchiectasis”). Drugs to decrease the immune response (known as “immunosuppressive drugs”)—such as chemotherapeutic drugs and steroids. Severe metabolic disorders—excess levels of urea and other nitrogenous waste products in the blood (known as “uremia” or “azotemia”); sugar diabetes (diabetes mellitus); excessive production of steroids by the adrenal glands (known as “hyperadrenocorticism” or “Cushing’s syndrome”). Presence of pus-forming bacteria and their poisons in the blood or tissues (known as “sepsis”). Age—very young more susceptible to fatal infections. Abnormal function of cells that normally remove bacteria and foreign materials from the body (known as “phagocyte dysfunction”)—feline leukemia virus (FeLV) infection and diabetes mellitus. Complement (a protein substance in the blood that contributes to the destruction and removal of bacteria from the body) deficiency—rare. Selective immunoglobulin A (IgA) deficiency; immunoglobulin A is an immune protein, found in the intestines; it functions as a protective barrier to prevent limit antigens (substance to which the immune system is responding and producing antibodies) and disease-causing microorganisms from entering the body through the intestines—rare. Combined T-cell and B-cell dysfunction—rare; a lymphocyte is a type of white blood cell, formed in lymphatic tissue throughout the body; lymphocytes are further divided into T lymphocytes (which are involved in cell-mediated immunity), so-called “T-cells” and B lymphocytes (which produce antibodies as part of the immune process), so-called “B-cells”—rare. Inpatient—recommended with signs involving multiple body systems (such as lack of appetite [anorexia], high fever, weight loss, and sluggishness [lethargy]). Maintain normal hydration—important to aid the normal secretion clearance mechanism of the lungs; use a balanced electrolyte solution. Administration of medication in a fine spray (known as “nebulization”) with saline aerosol—results in more rapid resolution, if used with physiotherapy and antibiotics. Physiotherapy—efforts to dislodge secretions in the lungs and to induce coughing (known as “coupage”); windpipe manipulation to stimulate mild cough; and postural drainage; may enhance clearance of secretions; always do immediately after nebulization; avoid allowing the pet to lie in one position for a prolonged time. Oxygen therapy—for pets with low levels of oxygen in their blood (known as “hypoxemia”) and signs of severe breathing difficulties (known as “respiratory distress”). Restrict during treatment (inpatient or outpatient), except as part of physiotherapy after administration of medication in a fine spray (nebulization). Ensure normal intake of food, with foods high in protein and calorie or energy density. Feeding directly into the intestinal tract (known as “enteral feeding”) or through the veins (known as “parenteral nutrition”)—indicated in severely ill pets. Use caution in feeding pets with an enlarged esophagus (megaesophagus); lack of normal function of the voice box or larynx (known as “laryngeal dysfunction”) or surgery on the voice box or larynx; disease of the throat or pharynx (known as “pharyngeal disease”), and pets that are unable to get up (they are recumbent). Surgical removal of a lung lobe (known as “lung lobectomy”)—may be indicated with lung abscesses or foreign body in the bronchus with secondary pneumonia; may be indicated if the pet is unresponsive to conventional treatment and disease is limited to one or two lobes of the lung(s). Antibiotics are best selected based on results of bacterial culture and susceptibility testing from transtracheal wash (a technique in which samples from the lower airways are obtained for bacterial culture and/or for evaluation through a microscope) or other diagnostic techniques. Reasonable initial antibiotic choices pending culture results include amoxicillin–clavulanic acid, cephalexin, enrofloxacin, or trimethoprim-sulfonamide. Gram-positive cocci—ampicillin, ampicillin-sulbactam; amoxicillin; amoxicillin–clavulanic acid; azithromycin; chloramphenicol, erythromycin; gentamicin; trimethoprim-sulfonamide; first-generation cephalosporins. Gram-negative rods—enrofloxacin; chloramphenicol; gentamicin; trimethoprim-sulfonamide; amikacin; marbofloxacin; carboxypenicillins. Anaerobes (bacteria that can live and grow in the absence of oxygen)—amoxicillin–clavulanic acid; chloramphenicol; metronidazole; clindamycin; ticarcillin-clavulanic acid. Administration of gentamicin in a fine spray (known as “gentamicin nebulization”) for Bordetella—typically used in conjunction with antibiotics given by mouth or injection. Continue treatment for at least 10 days beyond clinical resolution and/or 1–2 weeks following resolution of x-ray (radiograph) evidence of pneumonia. Recommended by some veterinarians; no objective evidence that they increase movement of mucus or mobilization of secretions. Recommended by some veterinarians; used to decrease spasm of the bronchi; bronchodilators are medications that enlarge the bronchi and bronchioles in the lungs. Monitor breathing rate and effort. Complete blood count (CBC) should be performed periodically; CBC should return to normal as the pet responds to treatment. Arterial blood gases, to monitor levels of oxygen and carbon dioxide in the blood—most sensitive monitor of progress. Monitor pulse oximetry; : “pulse oximetry” is a means of measuring oxygen levels in blood. Listen to the pet’s lungs (auscultate) frequently. Chest x-rays (radiographs)—improve more slowly than the clinical signs. Vaccination—against upper respiratory viruses; against Bordetella bronchiseptica, if dog is boarded or exposed to large number of other dogs. Catteries—environmental strategies to lower the number of cats or the close proximity in which they are housed (known as “population density”) and improve hygiene help control outbreaks of bordetellosis (infection caused by Bordetella). Presence of pus-forming bacteria and their poisons in the blood or tissues (sepsis). Prognosis—good with aggressive anti-bacterial and supportive therapy; more guarded in young pets, pets with decreased ability to develop a normal immune response (immunodeficiency), and pets that are debilitated or have severe underlying disease. Prolonged infection—potential for long-term (chronic) inflammation of the bronchi (bronchitis) or chronic dilation of bronchi or bronchioles, as a consequence of inflammation or blockage of the airway (bronchiectasis) in any pet. High death rates are associated with severely low levels of oxygen in the blood (hypoxemia) and presence of pus-forming bacteria and their poisons in the blood or tissues (sepsis). Inflammation in the lung as a response to disease-causing bacteria, characterized by accumulation of inflammatory cells and fluid in the lung, conducting airways (bronchi and bronchioles), and alveoli (the terminal portion of the airways, in which oxygen and carbon dioxide are exchanged). More common in dogs than in cats. Antibiotics are best selected based on results of bacterial culture and susceptibility testing. Here, we have listed some of the most common skin conditions and provided you with the typical symptoms, and possible treatment. In some instances (when possible), we’ve included information about treatment that can be done with readily available at-home remedies. However, we would like to remind you that most skin conditions can be difficult to treat and will require veterinary assistance. 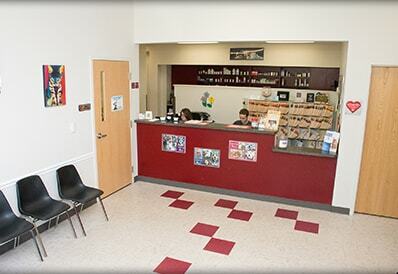 We will work closely with you to diagnose, treat and monitor any skin, ear, nail or foot problem your pet may have. We are here to help your pet with problems such as diseases of the skin, dog or cat ear infections or immune-mediated problems. Your pet’s immune system plays a large role in many of the dermatology problems in both dogs and cats that we see at Tri-County Animal Hospital. Just like humans who can inherit allergies in the “gene lottery”, our canine & feline counterparts can have this unfortunate trait passed down to them. Pet’s often show allergic reactions to certain grasses, plants, and even certain types of food. While humans generally show allergies through sneezing, dogs and cats usually show through their skin. In dogs, susceptibility to demodectic mange is another example of an immune related skin problem. This is a skin issue caused my microscopic mites, and can be relatively common in puppies. Diagnosis is determined through a simple skin scraping. Our veterinarians will look under the microscope to see if these mites are the cause of your dog’s skin condition, and recommend the appropriate treatment. 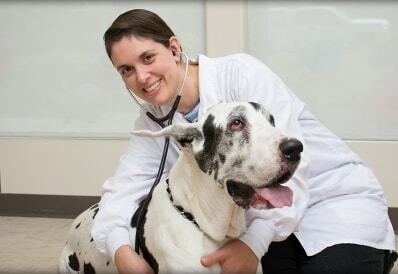 Environmental skin disorders are another common problem that we see at our animal hospital. The majority of these conditions are caused by excessive licking or chewing of the skin. In order to solve this challenge, our veterinarian not only treats the visible skin problem, but also determines the underlying problem that is causing your dog or cat to chew on themselves. Lick granulomas are an example of this type of skin condition. Oftentimes, dogs will lick themselves so excessively that an open wound is left behind. While there could be numerous reasons for this type of self-destructive behavior, it is usually the result of a psychological issue (boredom, stress, anxiety). Our Staff will work to pinpoint the cause and help eliminate the harmful behavior. Infectious skin diseases occur in both cats and dogs, and can be both contagious or non-contagious. The contagious infections fall under a broad range of viral, parasitic, fungal and bacterial diseases. Ringworm is one common example of this type of skin disorder. This fungal skin infection is contagious to dogs, cats and even humans. Diagnosis is determined through a culture, during which time, Dr. Silberman will advise treatment for your pet accordingly. Another example of an infectious skin disorder is a staph infection. Staph infection is caused by bacteria belonging to genus Staphylococcus, and usually presents on the skin as scales or severe redness. In these cases, Dr. Silberman will examine your pet and often take cotton swab culture samples and perform cytologic evaluation under the microscope. Sometimes, skin conditions are simply the manifestation of larger, underlying illnesses in your dog or cat. Many hormonal abnormalities have the ability to affect the quality of your pet’s skin and coat. In dogs, thyroid disease and Cushing’s Disease (hyperadrenocorticism), causing skin issues are probably the most common. Among cats, hyperthyroidism and diabetes may cause a dull coat, very matted fur, and in some cases, lose patches of hair from over-grooming. 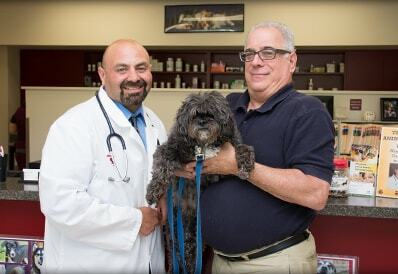 Dr. Silberman will determine which treatment is best for your pet, and discuss all available options with you.